Needless to say forgive me if all of my posts for the next few weeks are centered around peaches! This recipe started when I was at my hot preggo friend’s home sharing some of the peaches we had just gotten, and she was saying how one of her favorite ways to eat peaches growing up was simply cut up in a bowl of milk with a spoon. Now that’s my kind of cereal. So I went home and transformed her “Peaches n Milk” in to this perfectly paired Peaches n’ Coconut Cream sprinkled with cinnamon between each layer. And then after I devoured this…and another one. I got to think about how this would make a lovely Panna Cotta. 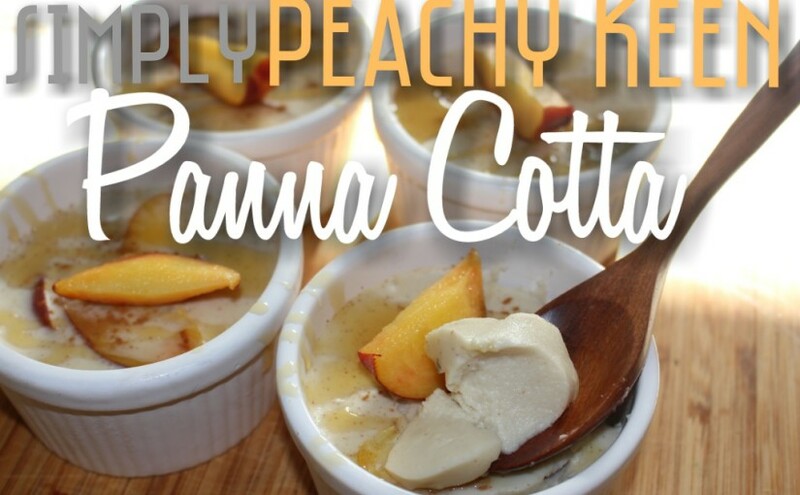 And so the Peaches n’ Coconut Creamed turned into this Simply Peachy Keen Panna Cotta! What is Panna Cotta you might be wondering. Well it is a lovely soft set pudding like dessert that is truly so simple to make yet seems so fancy! It’s generally made with cream, sugar, and gelatin that is simmered and cooled. It’s literal Italian translation is cooked cream. Again, so simple, yet people will be way more impressed when you show up with Panna Cotta (don’t you just love how it rolls off the tongue) instead of pudding. ***Note*** Regular gelatin is not as it is made from collagen of the bones of animals. Click Here for a link to a good vegan friendly gelatin option. Also click here to read about more vegetarian/vegan ‘gelling’ options. Pour 1/3 cup of the coconut milk into a very small bowl. Sprinkle the gelatin on top and let sit for about 1 to 2 minutes or until it “blooms” — the gelatin grains will swell and look like they’ve absorbed some liquid. While it sits, prepare the rest of the panna cotta. In a small pot, whisk the remainder of the coconut milk, maple syrup or honey, and cinnamon until they’re combined. Warm the mixture over medium-low heat for about 5 minutes. You want to warm the mixture enough so that it will dissolve the gelatin, but do not let it boil. Divide the peach slices among 4 bowls or ramekins (saving out some to put on top). Pour the panna cotta mixture over the peaches. Place in the fridge to chill. When the panna cotta is getting firm (after about an hour) evenly distribute the rest of the mango on top of the panna cotta and dust lightly with nutmeg. Chill until completely firm and serve.